Valium, the drug that revolutionized the treatment of anxiety and became a cultural icon, is 40 years old this year. The drug owes its success to the stubborn streak of chemist Leo Sternbach, who refused to quit after his boss at Hoffmann-La Roche ended a project to develop a tranquilizer to compete with a rival company's drug. Sternbach tested one last version and in just a day, he got the results: The compound made animals relaxed and limp. Sternbach had made the discovery that eventually led to Valium. It was approved for use in 1963 and became the country's most prescribed drug from 1969 to 1982. "It had no unpleasant side effects. It gave you a feeling of well-being," Sternbach, now 95, said recently at Hoffmann-La Roche's headquarters in Nutley. "Only when the sales figures came in, then I realized how important it was." The Roche Group, Hoffman-La Roche's parent, sold nearly 2.3 billion pills stamped with the trademark "V" at its 1978 peak. While its name was derived from the Latin word for being strong, Valium soon picked up nicknames: "Executive Excedrin," for its use by the corporate jet set, and "Mother's Little Helper," the title of a classic Rolling Stones tune about an overstressed housewife who "goes running for the shelter of a mother's little helper." Valium also was referred to as a "doll" one of the pills popped by female characters in novelist Jacqueline Susann's racy 1966 best-seller "Valley of the Dolls." Most of the prescriptions were written by family doctors rather than psychiatrists, and the majority of users were women. "It was chic," said Dr. Norman Sussman, professor of psychiatry at New York University School of Medicine. "Everyone was on it and talking about it" in an era of anxiety called the rat race. Named one of the 25 most influential Americans of the 20th century by U.S. News & World Report, Sternbach was born in Croatia and began his career in 1940 at Roche's headquarters in Switzerland after earning a Ph.D. in organic chemistry at University of Krakow in Poland. Fearing Nazis would occupy Switzerland, the company sent its Jewish scientists to the United States. Sternbach fled on June 22, 1941, with his new bride Herta, his landlady's daughter. "We came with only our clothes," she recalled. 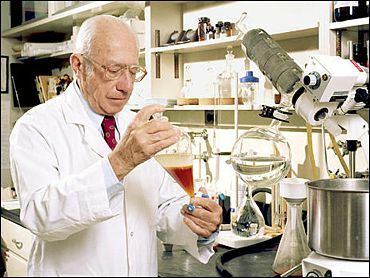 In the United States, Sternbach helped organize Roche's new chemical laboratory in Nutley, and his first big success was synthesizing biotin, a B vitamin that breaks down fatty acids and carbohydrates. With Valium, Sternbach gave the company its first blockbuster. Sternbach had created an entire new class of tranquilizers named benzodiazepines, which were safer and more effective than previous treatments such as barbiturates, opiates, alcohol and herbs. "It put us on the map," said George Abercrombie, president and chief executive officer of Hoffmann-La Roche. Unlike earlier drugs, Valium did not slow breathing, so patients couldn't use it to commit suicide. But it was overused, Sternbach said; some patients became addicted, so a doctor's visit was required for refills. Still, benzodiazepines remain the most prescribed anxiety drugs, partly because they start working as fast as one hour, slowing brain activity. They also are used for treating panic and phobia disorders and insomnia, calming patients before surgery and relaxing muscles. "They were the first weapons in our arsenal for fighting anxiety disorders," said Jerilyn Ross, president of the Anxiety Disorders Association of America. "It was a huge leap." Sternbach officially retired in 1973, but worked most days until recently. He mentored young scientists, corresponded and consulted with others, and worked on his biography, due out this fall under the title, "Good Chemistry: The Life and Times of Valium Inventor Leo Sternbach." Sternbach's credits include 241 patents, 122 publications, honorary degrees and other awards. His other breakthroughs include the sleeping pills Dalmane and Mogadon, Klonopin for epileptic seizures and Arfonad, for limiting bleeding during brain surgery. "Leo was a game changer, really. It's quite inspiring to be on a campus with someone with that impact," said Louis Renzetti, who heads the company's efforts to speed up discovery of new compounds. Until a decade ago, one-fourth of Roche's sales came from Sternbach discoveries. "He's an inventor's inventor," said Abercrombie. "Within every company, there is a person or two whose legacy becomes the hallmark of what the company is about, and for Roche, it is Dr. Sternbach."